Two stainless steel DAF units remove the MBBR effluent TSS prior to discharging from the Town of Ladysmith WWTP to the environment. A Canadian town needed an upgraded wastewater treatment system that would minimize its biological and separation footprint, while also meeting the new lower proposed effluent limits. Moving bed biofilm reactor (MBBR) technology and dissolved air flotation (DAF) technology from World Water Works solved the problem. Ladysmith, BC is home to nearly 8,000 people on the western coast of Canada and has a history of coal mining, forestry, rail and marine industry. An existing wastewater treatment plant (WWTP) provided treatment to the town’s wastewater before discharging to the Ladysmith Harbor. The plant removed primarily particulate matter and suspended solids from the wastewater to be driven to a composting site. The existing system met some needs, but would not be able to achieve the future biological oxygen demand (BOD) and total suspended solids (TSS) effluent limits proposed to the town. The Town of Ladysmith needed an upgraded wastewater treatment system that would minimize its biological and separation footprint, while also meeting the new lower proposed effluent limits of 15 mg/L for both BOD and TSS on an average monthly basis. 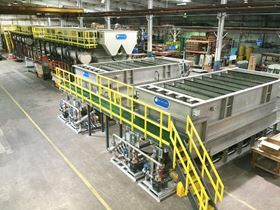 World Water Works’ moving bed biofilm reactor-dissolved air flotation (MBBR-DAF) technology was selected as the solution for the wastewater treatment upgrade. The MBBR reactor degrades organic matter resulting in BOD removal and the DAF component separates the biomass and solids from the water. This duo system allows the Town of Ladysmith the highest possible removal of BOD and TSS with the lowest possible footprint. Another bonus to the MBBR system is its adaptability for system upgrades. The Town of Ladysmith’s new system was designed with future flexibility for nitrification and denitrification, allowing for the construction of the system now with the addition of equipment later. World Water Works’ phased approach meant the system was up and running efficiently with improvements that met the community’s immediate needs, but left room for the town to revisit adding in the processes of denitrification and nitrification later should they choose. The new system was installed in 2015 following production in World Water Works’ manufacturing facility in Oklahoma City. The 2.66 MGD secondary wastewater treatment plant will treat mainly domestic sources. The system is designed to service a population of 17,000 and will treat the town’s wastewater for at least the next 20 years. The installed MBBR-DAF system enhanced the town’s ability to handle wastewater, providing an advanced secondary treatment to the town’s pre-existing WWTP. The system drastically reduced BOD and TSS amounts released into the nearby Ladysmith Harbor. With these improvements, the Town of Ladysmith was able to minimize its ecological footprint and during the systems performance test met an average of 8 mg/L BOD and 11 mg/L TSS. World Water Works completed work on the Town of Ladysmith’s Ideal MBBR-DAF system in the summer of 2016. The technology has met an array of needs for the town; it lessened environmental impacts, improved removal efficiencies and gave the town a scalable, long-term solution. World Water Works continues to work closely with the facility to meet current and future wastewater treatment needs. Moving Bed Biofilm Reactors can 'improve many industrial wastewater treatment systems'.